The Headhunter was summoned by an organization that goes by the name of the Orphanage, almost 20 years ago. Using a different experiment, they managed to call forth this creature, but their plans backfired as it proved too powerful for their restraints and escaped. The summoner fell ill from the extreme effort it took to call the Headhunter and died a few years later. The Headhunter remained hidden, cautious not to attract the orphanage's attention, in the meantime, it hunted, fed and gathered minions to itself until it considered it was strong enough to search for greener fields. With this in mind, it rallied its headless hunters and made its way to void city, to feast on the masses of unsuspecting inhabitants. The Headhunter could be considered a sort of undead, any physical damage done against it will result in quick regeneration unless it takes place on one of its heads. They are physical manifestations of the myths of headhunting beings in many cultures of the world. Should a headhunter lose all its heads, it'll die for good, the heads cannot be instantly regenerated. 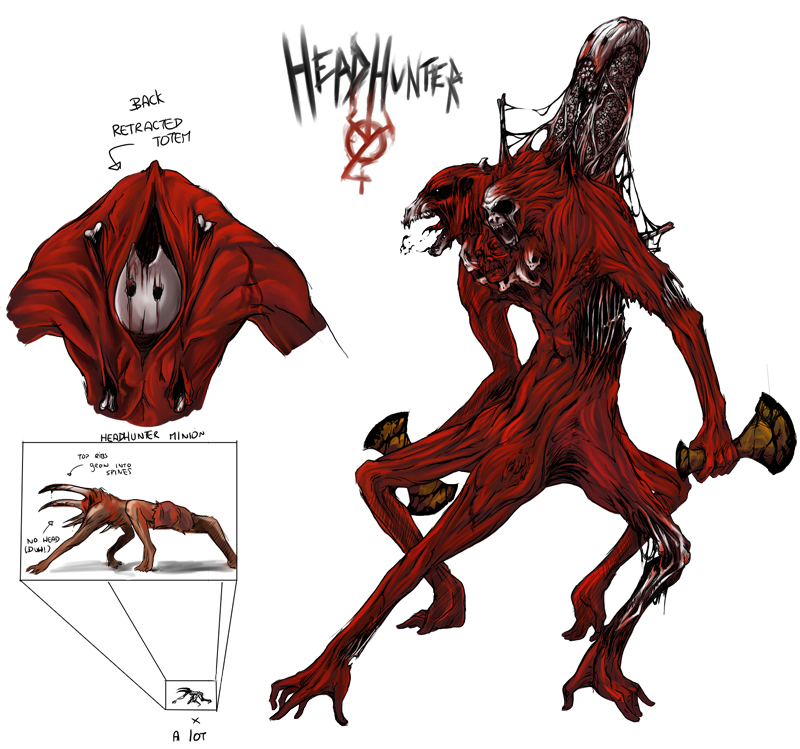 Should it find a being large enough though, the headhunter can decapitate it and attach its head to himself. The Headhunter's regeneration is not infinite either, he must fuel it using the flesh he consumes. Since this meat its not its own, it'll eventually rot and fall off his skeletal frame, causing the creature to be always on the prowl for more victims. The Headhunter does most of its hunting through headless minions, these creatures move erratically in a spiderlike motion (in all fours), being able to walk on walls and ceilings, looking for anything that moves to kill, they posses enlarged ribs that extend at tusks, when they kill someone and decapitate him, the victim will become a minion too. The minions take the heads they collect to the headhunter, who keeps them in a large totem it deploys from its back, still bound by the ideas that gave him shape. Should the Headhunter lose one of the skulls, the minion it belonged to originally will die too. Destructor - The Headhunter is driven by a burning hunger, though it is intelligent, all his efforts are oriented towards feeding and gathering more heads for its collection. He WILL try to kill and decapitate other monsters, as long as they're living beings, they will be subject to the same laws as the other headless minions, and let's say.. interesting stuff can happen. UPDATE - During his fight with Rawk Battoru, Headhunter managed to decapitate him, attaching his head to his left shoulder, which enables him to use Battoru's sonar powers and radioactive beam for a ranged attack. He also aqcuired Rawk Battoru's headless body as a minion. However, during his recent fight with Levitorah, he used Battoru's body to plug Levitorah's neck and prevent him from spewing acid. 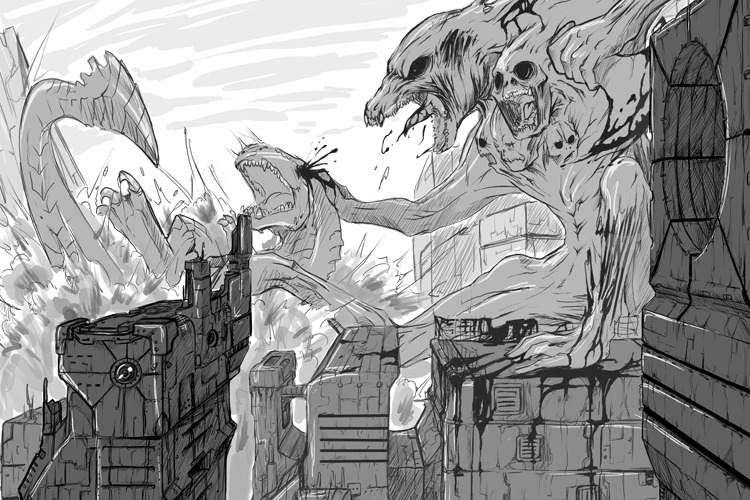 The acid built up inside Levitorah's neck and eventually exploded, since Levitorah was not decapitated by Headhunter or one of its minions perse, his body did not rise as one. Levih's head was too large for headhunter at the moment, so he's stashed it in the Void waterfront until the time when he's big enough to use it.